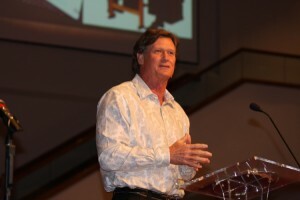 MOORE—Church leaders were urged to “shift” how they do ministry by speakers at the 2009 State Pastors’ Conference Nov. 9 at Moore, First. 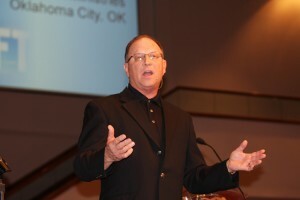 Jim Prock with Encouragement Ministries of Oklahoma City, focused on Rom. 12:2 “Be ye transformed by the renewing of your mind…” as he reminded the pastors and others present that Alfred Einstein’s definition of insanity was doing things the same way over and over and then expecting to achieve different results. 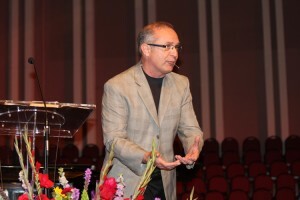 He said people don’t just want to come to church and fill a pew or become another statistic; nor are they essentially interested in our worship style. 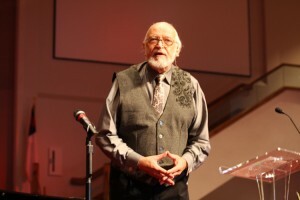 Bob Waitman, pastor of Madill, First, who described himself as a “hog farmer” who has served for 30 years as a bivocational pastor, likened many churches today to a lot full of stalled vehicles. 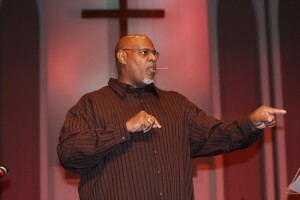 Waitman, who has led his church to massive growth in eight years, said “we need to be filled with power,” referring to Acts 1:8. But, while we are “powering up,” if you will, we need to make sure we shift without compromise, said Mike Booth, pastor of Oklahoma City, Emmaus. “We must learn to be in touch with the culture, but in tune with Christ,” Booth cautioned. Drawing a comparison between Americans by dividing them between those born before 1973 and those after 1973—the year the cell phone was invented—Booth said reaching both groups presents a challenge. He labeled those born before 1973 “Immigrants” and those after “Googlers.” The former, he said, are living in a world infused with the new language of the latter. He pointed out that the Bible wasn’t written in verses, but in stories. He said we must get rid of our other gods of today. Walter Wilson, pastor of Lawton, Friendship, reminded those present that one of the problems with change is it’s always met with opposition by mumblers and grumblers. “You can’t please God and man at the same time,” he proclaimed, “but, when God is in the building, it doesn’t really matter, because when God speaks, things change! Referencing the mumblers and grumblers among the Israelites fleeing from Egypt as they neared the Red Sea and saw Pharaoh approaching from behind, Wilson, said, “There were some Egyptians among the Children of God; they wanted to go back where they came from. Also giving testimonies were Jimmy Reed, pastor of Choctaw, Church on the Way, a new work, and Carlos Caceras, Hispanic pastor at Norman, Emanuel. In a short business session, Joe Ligon, pastor of Marlow, First, was elected first vice president, and Scott Watkins, pastor of Terlton, First, was elected second vice president of the Pastors’ Conference, both unopposed. Floyd McKee, pastor, Oklahoma City, Rancho Village, will serve as president next year after service as president elect this year.